The idea of gates, walls and fortification is as old as history can lead। Throughout the human history, mentioned has been made of walls and gates to protect the residence, and of those to breach the same. Who not knows walls and gates of Troy, Babylon, Ninevaeh, Khyber, Dehli or Lahore. According to history, Akbar during his residence at Lahore(1584 -1598) enclosed the city with brick-walls and gates of considerable height and strength। These city walls were fast falling into decay, when Ranjit Singh rebuilt them in 1812 to a great extent. The city walls, which were formerly more than 30 feet in height, were reduced to 15 feet for sanitary purposes in British Period and along with the renovation of the gate - meeting the modern requirements. A time came when these walls altogether vanished leaving their gates standing alone without purpose - only the reminiscent and glory of the past। Comparison between the on-ground existing gates of Lahore and the old pictures and drawings of old Lahore, showing these gates, on display in Lahore Museum and books, do not coincide. Something is missing? Yes, present existing gates such as Dehli Gate and their drawings are quite different. These are renovated gates of the British Period. If that is so, what was their original shape and structure! A closer look on museum and contemporary drawings such as that of Taxali Gate reveals that as a defensive measure against any intruder or enemy, there used to be no direct or straight approach to these gates but one had to face obstruction like semi-circular or rectangular type structure od sufficient height, strengthened with brick-walls stones and marter- the case maybe was built in front of the actual gate leaving the access to the gate from the side only. In olden times, same was the case with gates of Lahore. These were 12 circling the city।The most prominent gate was 'ROSHANI GATE' situated at the northern extreme of the city, adjacent to the Lahore Fort. It derived its name from ROSHNI - the light, as it was lit immensely at night . Being Being the principal entrance form fort to city, it was most frequented by the Omerahs, Courtiers, Royal servants and the retinues. The quarters about here are profusely lighted up it was so-called gate of Light.It is also supposed that the gate owes its name to the people of Roushnai sect which sprung up in Akbar's time under Afghan, but the authority of the Roushnai was confined to the hills of Suliman and Khyber ranges and they had no influence beyond these hills.Among many a legends and tales of this magnificent gate, Ranjit Singh was succeeded by his elder son Kharak Singh, who died in Lahore in 1840 and was succeeded by his son Naunihal Singh. This later met his death by the fall of a portion of the archway of the gate. "Leading to Hazoori Bagh as he was returning after performing after performing the funeral rides of his father, hand-in-hand with Mian Uddam Singh, the eldest son of his chief minster Dhiyan Singh, as both entered the archway, a loud crash was heard and it was found that a frement of the upper wall had fallen and crushed the two young men walking under it. 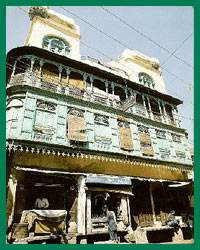 "At present this gate is in dilapidated condition aNand is permanently closed as being the part of the of Mahaeaja Ranjit Singh and others.